Aquaheat produces highly detailed construction models that go beyond merely showing services reticulation routes. Our highly skilled in-house specialists develop Consulting Engineers drawings into 3D intelligent Building Information Models (BIM) using Revit MEP for all mechanical services. Navis software is used to validate detect clashes in the model, service-to-service and service-to-building fabric. From the model, detailed coordinated working drawings are produced, which are fully coordinated, detailed and dimensioned. A key benefit of using MEP Fabrication (BIM software) is that all services can be clash detective service-to-service, following which structural and architectural models are produced, service to building fabric. Aquaheat produces highly detailed construction models that go beyond merely showing services’ reticulation routes. Our models include secondary support structures and seismic bracing so the detailed solution is fully coordinated with the building structure and other trades. In projects involving alterations to existing buildings and services we utilise 3D scanning to establish accurate modelling of the existing installation. 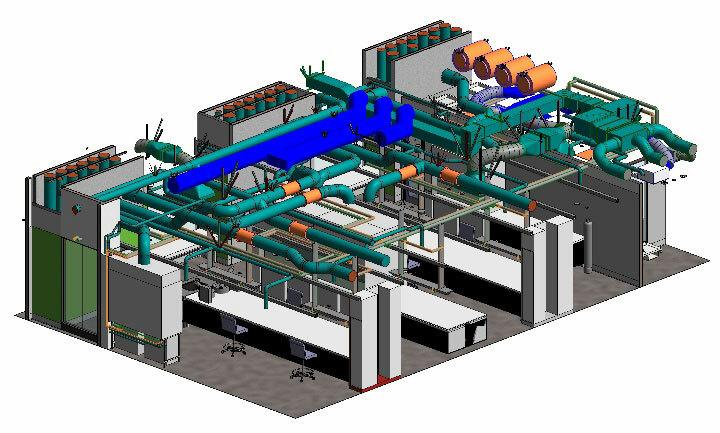 Aquaheat has experience in developing the Revit model into a true BIM model by populating non-graphical data into the model, so that it becomes a key part of the clients’ asset and facility management processes.